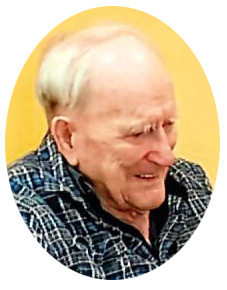 Andreas “Andy” Peter Pankratz passed away peacefully in his 96th year on April 15, 2019 at Rose Villa in Rosetown. He was born on August 16, 1923 in Zentral, Russia and he emigrated to Canada with his parents and older brother in 1926. They arrived in Milden, Saskatchewan and established a farm in the Fiske area the next year. Growing up, Andy was very mechanically minded. He enjoyed working with his hands and had a gift for fixing any machinery that was broken. He gradually moved to Ontario where he worked in the trucking and construction industries. For many years in his adult life, he worked as a heavy equipment operator in Ontario and the Bahamas. In the early 1980’s, Andy returned to Fiske to help the family out working on the family farm. He was a true farmer and loved to watch the crops grow. Andy loved being outside in the wide-open prairie checking out the crops. There was nothing he liked better than spending an afternoon driving the country roads. After his brother John passed away in 1993, Andy and his sister Mary continued to farm together for the next 22 years until Andy was 92 years old. In 2015, Andy and Mary moved into Orange Memories Care Home. Andy was predeceased by his parents, two brothers and a sister. Andy is survived by his devoted sister Mary, a niece, two nephews and their families. A Memorial Service was held on Thursday, April 18, 2019 at 2:00 p.m. at the Chapel of Shanidar Funeral Services, 510 Young Street, Rosetown, SK with Pastor John Barkman officiating. In lieu of flowers, donations may be made to the Salvation Army 2 Overlea Blvd, Toronto, ON, M4H 1P4 or to a charity of the donor’s choice. Many thanks to the staff at Rose Villa and Orange Memories for the care Andy received.